Is Sauze d’Oulx the genuine birthplace of Italian skiing? Some say so, what with the resort having been doing its thing since as far back as 1899. In any case, Sauze d’Oulx serves up three of the most important things any visitor could ask for – short transfers, gorgeous slopes and breathtaking scenery on all sides. Oh and trees…lots and lots of trees! It may not have enjoyed a good run of weather over recent winters, but the good thing is you’re never far from a whole world of pristine-piste action across the wider Milky Way ski area! Sauze d’Oulx is positioned at the far end of the Milky Way circuit, where in ideal conditions you can ski all the way to Montgenevre. Situated just a couple of hours away from a handful of airports, it’s hardly surprising that Sauze d’Oulx has become a firm favourite for weekend trips and short breaks. It’s also well-loved by semi-local Italians, too. Once an infamously lively resort, things have quietened down significantly over recent years. To such an extent that Sauze d’Oulx now looks and feels more like a large village than a small town. The pedestrianised centre is still home to an endless array of bars, restaurants and entertainment venues of all kinds. The only difference these days being that the ravers of the 90s have been replaced predominantly by families. Not to mention, anyone looking to escape the yobs and louts that now head elsewhere, having once smudged the reputation of Sauze d’Oulx! Oulx is the nearest train station to Sauze. Or if you prefer the station’s full name, try Oulx-Cesana-Claviere-Sestriere on for size! From Oulx it’s a 10-minute bus journey up the mountain to Sauze. Snow Carbon is a good website for anyone looking to travel to the Alps by train. We use a dynamic pricing system to ensure that our customers always pay the lowest possible price for Sauze d’Oulx resort transfers. For an accurate quotation, we’ll first need to know the specifics of your group and your travel plans. However, Alps2Alps will do everything possible to provide you with the fastest, cheapest and most reliable Sauze d’Oulx resort transfers on the market. All of the above will only ever result in our base-rate for ski transfers going down – we never over-inflate our prices at any time or for any reason. We also offer substantial discounts for off-peak, off-season and midweek transfers to Sauze d’Oulx. If looking for the best possible deals, travelling outside peak season or midweek typically results in the biggest savings. We offer midweek (Monday to Friday) prices with up to 60% discount than weekend prices. As mentioned before, the fact that Sauze d’Oulx makes up part of the Milky Way ski area means more than 400 km of pistes and 69 ski lifts within easy reach. So even when you’ve tried all the rest has to offer, you’re never far away from a whole world of new experiences! Sauze d’Oulx has seen such a transformation over the years that the local scene really is nothing like it used to be. Once the kind of place you’d normally associate with rowdy groups and stag parties, it’s now a comprehensively family-focused resort with so much on offer. Not to mention, a handful of outstanding ski schools for kids and adults of all ages. 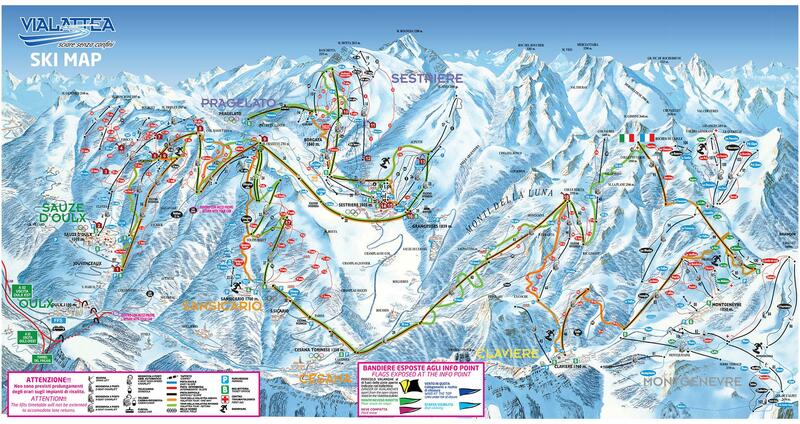 When looking to book resort transfers to and from Sauze d’Oulx, you need to tick a few important boxes. Low prices are one thing, but how about reliability, punctuality and comfort? Or for that matter, vehicles that can get you where you’re going safely? We advise booking early to gain access to the best deal available. However, you can be assured of the same high-quality, low-cost Sauze d’Oulx resort transfers whenever you book with Alps2Alps. We’re all about kicking your trip off in style – the moment you step on board!